But the quilt itself was not complete. A quilt is like a sandwich, and the pieced quilt top was the top slice of bread. Caroline and Lydia also needed a bottom slice of bread, which was often plain cloth. In places with cold winters, the middle layer was usually made of wool. In the spring, farmers sheared their sheep. It was a lot of work to clean the wool, pick out snarls, and comb out the fibers. Once enough wool had been cleaned and combed, the layers of the quilt could be put together. 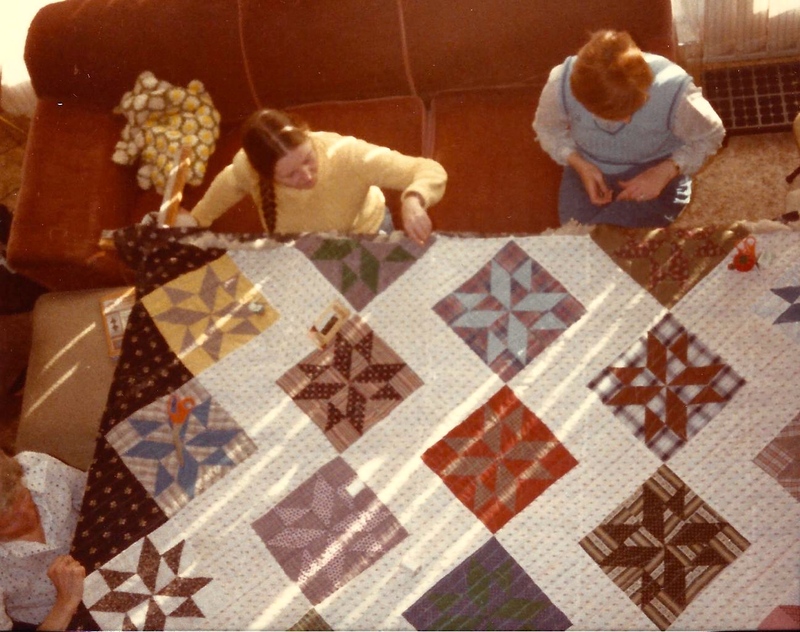 Women spread the bottom layer on a big wooden frame, arranged the combed wool, and then carefully put the pretty quilt top in place. Then the three layers needed to be stitched together. These are called quilting stitches. The women who made this quilt stitched straight lines through the blue and white blocks, but added a pretty quilted pattern in the open areas. The frame was propped up at a height that was comfortable for women to sit and sew. 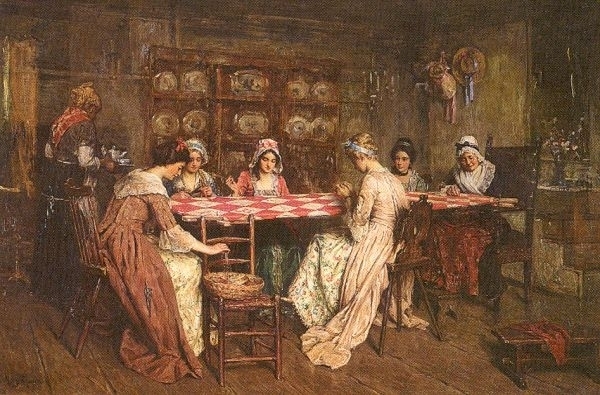 A Quilting Party, by Enoch Wood Perry, 1876. A lot of stitches were needed to hold the layers together. 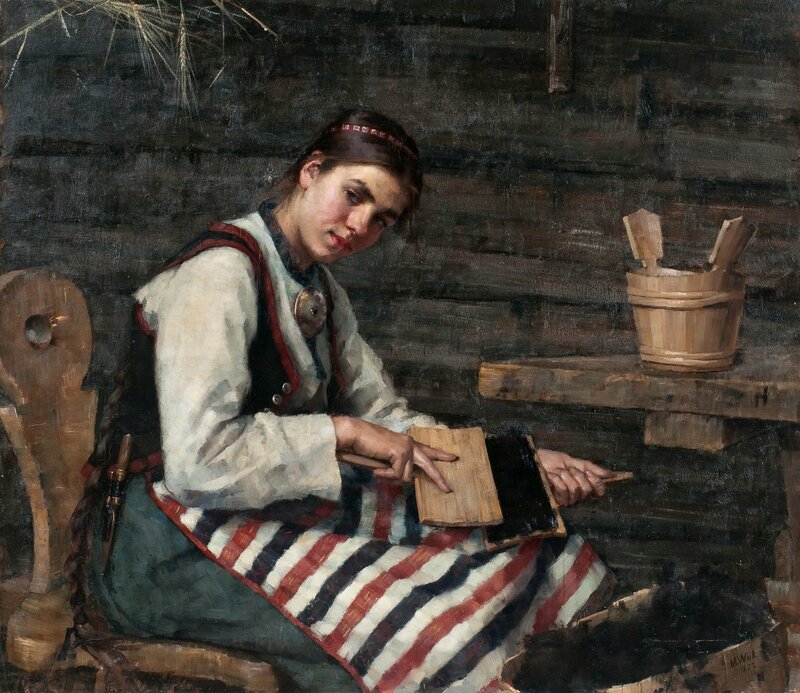 In Caroline’s day, girls and women often invited friends to quilting bees. The work went faster, and everyone enjoyed catching up on the news while they sewed. 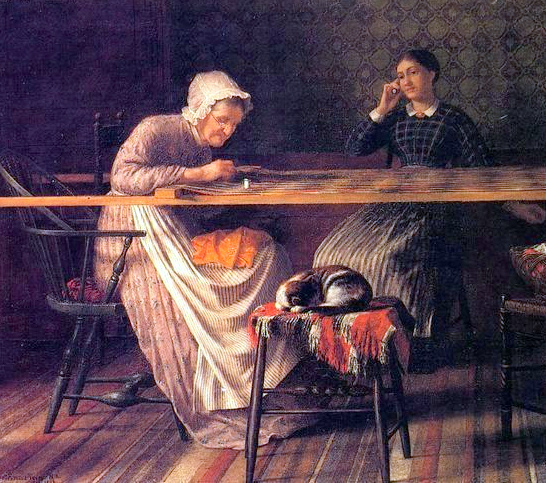 Quilting Bee, by Henry Mosler. It was painted about 1890, but shows an earlier time. With luck and hard work, the quilting might be completed in a day. In the 1813 painting below, the woman on the left is removing a quilt from a quilting frame, and it looks as if a party is going to begin. The Quilting Frolic, by John Lewis Krimmel. Quilting bees aren’t as common as they were two hundred years ago, but they still sometimes take place. The photo below was taken at my house in 1983, when I worked at Old World Wisconsin. My friends and I had pieced a quilt top at the historic site, but the season ended before we had a chance to finish it. It was fun, and the finished quilt was beautiful. 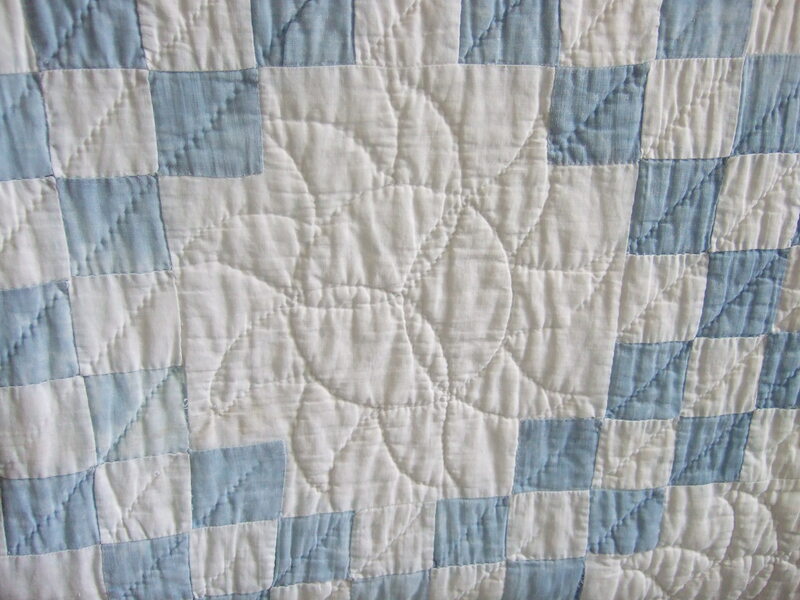 Whenever I see an old quilt, I wonder about the girls and/or women who made it. I know it took a lot of hours to complete, but I hope they also took joy in producing something both useful and beautiful. This entry was posted on March 24, 2015 at 4:23 pm and is filed under Caroline Abbott books. You can follow any responses to this entry through the RSS 2.0 feed. You can leave a response, or trackback from your own site. I suspect I like taking classes (quilting, rosemaling, wycinanki…) so much not only because I like to learn, but because I miss the social aspect of handwork like quilting I used to enjoy in the museum world. Ruth, how lovely that you are able to enjoy the social and charitable aspects of quilting. And also that you were able to complete your first quilt! I dug my first quilt from the closet while working on the post…it’s nothing special, but it brought back nice memories.